Teach Chizalum to read. Teach her to love books. The best way is by casual example. If she sees you reading, she will understand that reading is valuable. If she were not to go to school, and merely just read books, she would arguably become more knowledgeable than a conventionally educated child. Books will help her understand and question the world, help her express herself, and help her in whatever she wants to become – a chef, a scientist, a singer all benefit from the skills that reading brings. I do not mean school books. I mean books that have nothing to do with school, autobiographies and novels and histories. If all else fails, pay her to read. Reward her. I know of this incredible Nigerian woman who was raising her child in the US; her child did not take to reading so she decided to pay her 5 cents per page. An expensive endeavor, she later joked, but a worthy investment. – Dear Ijawele, A Feminist Manifesto in Fifteen Suggestions. THE AFRO READER IS A SOCIAL ENTERPRISE COMMITTED TO PROMOTING AFRICAN LITERATURE. Our target audience is YOU and everyone you know. Yes! The Afro Reader was born out of a desire to promote the reading culture. The news out there is that the average Nigerian does not read. 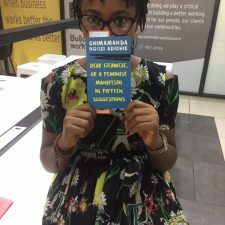 The reading culture in Nigeria is low and this is influenced by varying factors: Illiteracy, poverty, lack of opportunities, limited access to books, limited access to educational resources and a lot of families do not value reading. The Afro Reader, through it's website and Vlog is promoting a culture that values literacy and education and creating an environment that rewards literacy. Literature helps us understand the world better and even become more better versions of ourselves. We believe we can change the world one book at a time.